That said, she is closer to Florestan than she is to Eusebius, the dreamy, introspective side of Schumann's personality regularly coming to the surface. That can cause an imbalance; it exaggerates the flowing tenderness of the quieter music. But it is also present in the louder movements too, were it forms an elegant balance to rigidity of Schumann's march rhythms. 'Control' is usually a dirty word when it comes to piano playing, especially if it involves the Romantic repertoire, but the more I listen to this recording, the more Ammara's sense of interpretive control endears her playing. Above all, it allows both cycles, and Carnaval in particular, to unfold as a narrative. 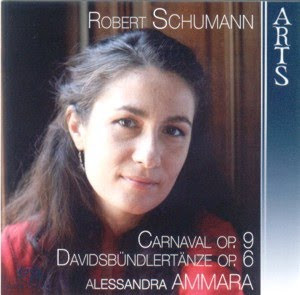 Schumann’s teasing introductions to many of the movements are ideally paced, and Ammara has a rare ability to give her playing a furtive quality, even in the context of rock solid technique and note perfect execution. It is an impressive skill, and Schumann's poetics are ideal medium to show it off. 'THIS IS AN AUDIOPHILE RECORDING' the liner declares as soon as you open the front cover. I can't argue with that, but it is interesting to compare the sound quality here to that of other recent SACDs of piano music. The microphones are positioned close to the piano, so ambience is at a premium. The notes of the phrases flow into each other well, even if the pianists strict phrasing keeps the phrases themselves distinct. The sound is clear, but it is never austere. And there is as much bass as you could want. The balance between the registers is also well judged, which is just as well considering how often Schumann requires the pianist to leap up the keyboard in octaves of cascade down in hoquets.